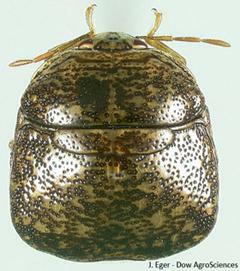 In 2009, the kudzu bug, Megacopta cribraria (F.), also known by many names including bean plataspid, lablab bug, and globular stink bug, was reported in nine counties in northeastern Georgia. The following year, the insect had been found in over 60 counties in Georgia and in Macon County, NC. Since then, surveys by thr NC State Entomology Department and the North Carolina Department of Agriculture & Consumer Services have confirmed the presence of the kudzu bug in kudzu patches, soybean fields, and on other plants such as wisteria in more than 89 North Carolina counties (Figure 1) and in seven states (check kudzubug.org to see an updated regional map). It is likely present in many other counties but simply has not yet been seen there. Figure 1. 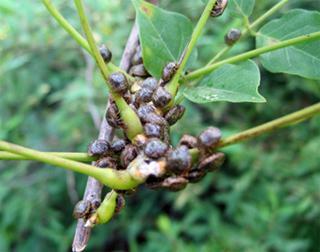 Kudzu bugs are found in 89 of North Carolina's 100 counties. Kudzu bugs are 4 to 6 mm long (about 1⁄6 - 1⁄4-inch), somewhat oblong in shape, and olive-green colored with brown speckles (Figure 2). They are "true bugs" and so they have piercing-sucking mouthparts. Aside from kudzu, these insects are known to feed on a wide variety of legumes (soybeans and other bean species, as well as wisteria (Figure 3) and some vetches, Eger et al. 2010). Kudzu bugs have several generations per year. In the spring, they feed extensively in kudzu patches and on other legume hosts. In July-August, they will move into soybeans where they feed on stems and foliage and can have a significant impact on crop yields. The bugs continue to feed and lay eggs into the fall on kudzu, late-planted soybeans, and other hosts. As temperatures and day length decline, kudzu bugs seek out sheltered areas where they can pass the winter, such as under bark or rocks, or in leaf litter, etc (Figure 4). They are most common along the edges of kudzu patches and soybean fields and in areas near residential areas, we can expect to see them invade homes simiilar to the behavior of another nuisance pest - the Asian lady beetle. 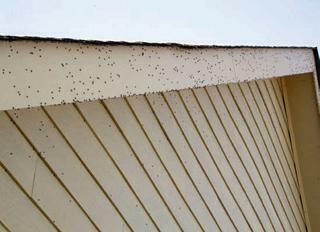 The bugs will often congregate on light-colored surfaces (such as siding, fascia boards, etc.) as seen in Figure 5. They will then move under siding, or into gaps around doors and windows, or through penetrations such as around air condtioning and water pipes. The following spring, the bugs become active again and begin moving onto kudzu and other host plants, particularly wisteria. As a result, those bugs which have overwintered inside homes (inside walls, attics, etc.) may end up inside the home instead of heading to food sources. They may also land on siding and will deposit their eggs on non-plant surfaces such as brick, vinyl, and other siding materials. Figure 3. Kudzu bugs on wisteria. Figure 4. 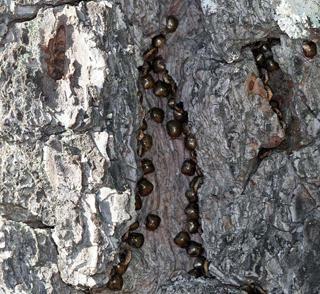 Kudzu bugs aggregating in tree bark crevices. Figure 5. Kudzu bugs on home. Exercise extreme caution when spraying overhead because chemicals will likely drop down on you and objects around you. Wear protective clothing and equipment (gloves, goggles, etc.) to keep insecticide off your skin, hair and eyes. Always spray downwind relative to where you're standing. Be sure to remove or cover objects such as outdoor chairs, grills, swimming and decorative pools, and children's toys. Read the pesticide labels carefully because many of the common products no longer allow for broadcast exterior treatments (i.e., wide sprays over the entire exterior siding) where pesticides are more likely to be washed off by rain and may potentially moved into storm drains. Be careful when spraying near ponds and other bodies of water and near hard surfaces (such as sidewalks or driveways) where the chemical is more likely to run into storm drains after heavy rainfall. Pesticides have limited ability to stop the bugs from entering homes. So, it is also important to seal gaps and openings (such as around plumbing and AC lines) to prevent the bugs from entering home. Avoid crushing insects that do find their way indoors as this may stain surfaces and / or result in unpleasant odors. Vacuum up the insects and then place the vacuum bag (or contents) into a trash bag and freeze the bag for several days. You can also drop the bugs into soapy water to kill them. If you simply dump the live insects outdoors, they will likely end up back inside or surviving somewhere else around your property. Removing kudzu patches in neighboring areas can be helpful but may be difficult unless you get cooperation from the property owner. Treating kudzu for the bugs is difficult without the proper equipment and care must be exercised to make sure the pesticides do not run off into sensitive areas such as wetlands, creeks, etc. The insects are fairly mobile (they crawl and fly) and so even eradicating (or attempting to eradicate) kudzu in or near your yard may not solve the problem. Eger, J. E., Jr., L. M. Ames, D. R. Suiter, T. M. Jenkins, D. A. Rider, and S. E. Halbert. 2010. Occurrence of the Old World bug Megacopta cribraria (F.) (Heteroptera: Plataspidae) in Georgia: A serious home invader and potential legume pest. Insecta Mundi 0121: 1-11. Megacoptera cribaria as a Nuisance Pest. D.R. Suiter, L. M. Jones, J. E. Eger, and W. A. Gardner. 2010; UGA-CAES Extension Circular No. 991.